Below you can find driving directions from Google Maps to help you get from Jupiter to your nearest Fix Apple Now store, situated in Hallandale. You can either copy the driving instructions below or click here for a larger map and driving directions. 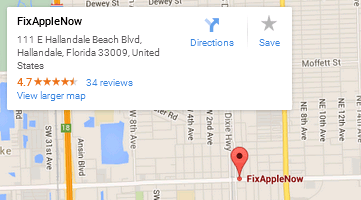 If you need to fix your Apple device in Jupiter, talk to Fix Apple Now today. At Fix Apple Now, we can repair, mend, replace, restore or reset your iPhone 4,5 or 6, iPad, Mac Mini, iMac or iPod for less. Our engineers have years of experience to draw upon and are never happy until they've returned your device to its former glory. Why not get in touch with us today if your Apple device isn't working as it should and you need to get a fix sorted as soon as possible?